Playoff roller derby is happening! We didn’t forget—we were just lamenting about days gone by.1In other words, dealing with the aftermath of an auto accident. Don’t worry, your brave author is OK! (By the way, would anyone be interested in buying a recently-shortened 2005 Nissan Sentra?) 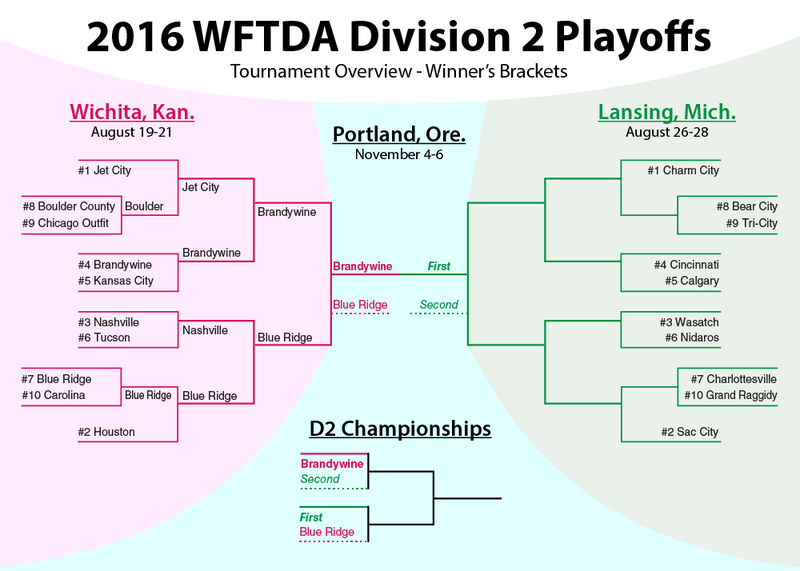 And we’ve recently been informed that Brandywine Roller Derby and the Blue Ridge Rollergirls played against each other in the final game of the Division 2 playoff tournament in Wichita last weekend, earning them spots at the WFTDA Championships this November. Congratulations to both teams, particularly to Brandywine for holding off Blue Ridge all the way through to the last jam to button up the overall win. Their game happened to be the best of the weekend, so in case you don’t have it in mind, get reacquainted with it via the replay. The second of the two Division 2 playoff tournaments is on this weekend in Lansing, Michigan. Ten more teams are vying for the remaining two places available at WFTDA Championships, where the first- and second-placed teams will switch off and play against each other to open proceedings in Portland. We’ll preview those teams shortly. Ahead of that, here are some pertinent stats from last weekend. The Division 2 playoffs last year were nothing short of a bloodbath. After both tournaments and the D2 games at WFTDA Championships, the field committed an average of 83.3 penalties per game. This continued the WFTDA’s years-long streak of a playoff tournament with an increase of penalties over the previous year.2Actually, Division 1 penalties were incrementally lower in 2015 vs. 2014. But the 13% jump in Division 2 last year cancelled that out handily. Surely, we were reaching the limit? It would have been unthinkable for that number to be just as high, or higher, during the course of play this year. Thankfully, things have settled down out of the gate in 2016. Despite no significant change to the frequency of cutting penalties (12.6 per game) or forearm calls (11.1) over 2015, the average penalty rate seen over the 17 games in Wichita was 65.8 per game. That’s a drop of 21%! There’s no asterisk on this improvement, either. Bad blowouts generally see fewer penalties given the reduced amount of action between the teams, but there was only one to speak of last weekend. But two of the closest games, Kansas City/Boulder County and the Brandywine/Blue Ridge final, were some of the cleanest. Although there were a couple of games with penalty counts in the 90s, and there’s another D2 tournament yet to be played, it’s pretty much impossible at this point for the overall penalty average in the division to increase again this year. That’s not saying a lot considering how downright awful play was from a penalty standpoint in 2015, but we have to give the teams credit where it’s due. Let’s hope cleaner play will continue this weekend, and into the Division 1 tournaments through September. 2016 Division 2 Playoffs – Lansing, Mich. The live feed of the games from Lansing is available on WFTDA.tv. The audio portion is free, but you’ll need to drop $12.99 for the HD livestream to see the all-important video portion. You can optionally still purchase the all-playoffs pass for visual access to the remaining six Division 1 and Division 2 tournaments for $75, still cheaper than buying all the tournaments individually. Woah, Charm City! What are you doing down here in Division 2!? A shoo-in for a middle seed in Division 1 over the last few years, Charm got hit with a roster shakeup at the worst possible time. Big losses against Atlanta (-91 points) in May and Boston (-109) in June did just enough to knock them out of the top 40. Charm has recovered in time for the playoffs, however, playing closer to the level we’re used to seeing them. Earlier this month, they beat #37 Steel City 254-117, a walloping that woudln’t be out of place in the early rounds of a Division 1 tournament. Instead, we’re going to see them do a bit of walloping in Division 2. Many of Charm City’s potential opponents may be over their heads, if their low Flat Track Stats rankings (compared to their WFTDA rankings) are any indication. Not that Charm won’t get into a fist fight this weekend, but it may not be until the final when a ticket to the D2 Championships is already safe. This year’s Sac City team is tricky to gauge. They were D2 Runners-up in 2013, didn’t even making the playoffs in 2014, barely made it back last year, and are now a high seed in Division 2 once again. Their results over the years have been inconsistent, but at least we had a large schedule to judge the team by, with regular seasons that clearly matched their playoff results each year. This year, however, Sac City has only played four sanctioned games. The two most significant were losses against Jet City (-4) and Kansas City (-32) earlier this year. Those results certainly helped get Sac City up into the 2-seed this weekend, but FTS holds a dim view of Sac’s chances of holding on to it. The 18-rank difference between the WFTDA and FTS systems is the largest discrepancy of any team playing this weekend, signaling that the team may not be strong coming in to the playoffs. 2016 Close Games Record: 2-23We call a “close game” one that finishes within 25 points, but we’re including a 26-point win and a 26-point loss, both against Boulder County, in this 2-2 close game record for sanity’s sake. Initially a D1 playoff team, Wasatch slipped down to the Division 2 playoffs last year and are solidly back in D2 again this year. Their schedule this season consisted of teams at or above their rank level, including several teams that played in Kansas last weekend. Most recently, they licked the Chicago Outfit 282-134 at their home tournament, the Great Salt Skate. Wasatch also defeated Calgary, this weekend’s 5-seed, 215-147 in April at Skate to Thrill. It’s been a long time coming for the Cincinnati to get back to the playoffs. Any playoffs! After the switch to the divisional format in 2013, Cincy made it to Division 1 and picked up a win in one postseason game. They missed the cut in 2014 and 2015, but they’re back now, albeit in Division 2. Like Wasatch, Cincinnati has played a few Division 2 playoff teams this year. They beat the Wichita 10-seed Carolina, 155-99, just last month. However, their recent results against opponents in this tournament should be case for concern. This weekend’s 10-seed, Grand Raggidy, beat Cincinnati 165-156 at Midwest BrewHaha. Also beating Cincy at BrewHaHa? The team’s first round opponent, Calgary, by the score of 212-161. Gulp! Calgary has got to be happy with its position this weekend. It’s tracking much stronger on Flat Track Stats compared to the other teams, and has that comfortable win over Cincinnati to reminisce about. It also beat Tri-City earlier this year, the tournament’s 9-seed. This is Calgary’s very first appearance in a WFTDA playoff tournament. It’s not their first appearance in roller derby tournament, though; virtually all of Calgary’s schedule over the last two years consisted of multi-day, multi-bout events. That’s good experience for the D2, a multi-day, multi-bout event itself. But this one counts for something more than any of the others Calgary have been in. Can it take advantage and make to yet another multi-day, multi-bout event in Portland this November? Norwegians! That’s what Nidaros are, being from Norway and all that. They’re the first team from that country to participate in the North American-based international WFTDA tournaments. Nidaros has been through the U.S. a few times already in the last two years. After winning a couple of games at the 2014 WFTDA Euro Tournament, they packed their bags for Florida and Beach Brawl 2015, going 3-0. In 2016, after only playing one unsanctioned sanctioned game in the Eurozone, they flew to Michigan to play four games in two days to meet their sanctioning requirements and become playoff eligible. The close games record, a new addition this year to our list of stats for each playoff team, was inspired by Charlottesville. It shows how many wins and losses each team has in games with close finishes (final score within 25 points) out of the team’s overall record. It’s good to know heading into the close-game minefield that is Division 2 playoff roller derby. For Charlottesville, an 0-9 record on the year sounds awfully ordinary, especially for a team that debuted in Division 1 last year. However, that 0-5 close games record says a lot more. Now get this: Those five losses were by a combined 21 points, including two 1-point losses. That tells you everything. That’s incredibly bad luck. That many losses could have just as easily become that many wins, had the team gotten some breaks. Maybe a run through Division 2 will allow them to make their own breaks. More close finishes are inevitable. Surely, they’ll pick up a close win before the year is over? Another team that was busy at the BrewHaHa, Bear City represented the German capital well with 4-game schedule, splitting it 2-2. One of those wins was against Grand Raggidy. (Them again!) it was a close one in the end, but Bear City prevailed 199-182. The Berliners have also been busy during past playoff seasons, making it to Division 2 for three years in a row now. They were previously a #9 seed (2014) and a #10 seed (2015). They are currently the #8 seed. Talk about consistency! Bear City has also consistently won a lot of its playoff games and finished higher than they started, so look for them to try to do it again in 2016. Tri-City was ousted of the Divisoin 1 playoffs last year very quickly, losing all three of its games without much to say about it. However, being at the bottom of Division 1 is a much better place to be than at the bottom of Division 2, which is where Tri-City finds themselves this year. Tri-City was also in Milwaukee for the 2016 Division 2 Playoff Team Convention and Luncheon, also known as Midwest BrewHaHa. Kitchener’s team beat last weekend’s 3-seed and 4th-place finisher Nashville by the score of 178-156. It was only one of three victories for Tri-City this year, including their only win in a close game. One of their close losses was against 5-seed Calgary, 196-183. Last month, Charm City played Tri-City in a playoffs warmup, with Baltimore winning 199-156. Exactly one-half of Grand Raggidy’s 12 games this year were played against teams in the D2 playoffs. Of those six opponents, three played last weekend and three will play this weekend. Raggidy’s 1-5 record against these teams goes a long way in explaining why the team is seeded 10th in Lansing. Though Cincinnati lost to them by 9 points, and Bear City could only manage a 17 point victory, Flat Track Stats is not a fan of Grand Raggidy at the moment. Their FTS rank of #73 is the lowest of any team in the tournament, and is a good distance away from their #61 WFTDA ranking. That’s not a good sign for GRRD fans hoping for a victory this weekend.